Visually balanced designs provide a sense or order and equilibrium that makes them feel stable, natural, and right. On the other hand designs that aren’t balanced creates visual tension, and some elements may dominate the entire design – to the detriment of others. In a symmetrically balanced design you can draw a line down the middle (either vertically or horizontally) and the elements will be mirrored on either side. It should be noted that the elements don’t need to be identical, but rather they should have a similar position, size, appearance, and overall visual weight. Although this is one of the easiest types of balance to execute, it can be a bit dull and may look mundane. The key to asymmetrical balance is balancing the combined visual weight of elements on both sides of the composition – while using elements of different sizes, appearances, and positions. For example a large element on one side may be balanced by a handful of smaller elements on the other side. On the surface asymmetrical balance appears more casual and free, however it is more difficult to pull off and requires careful planning. As its name suggests, radial balance takes place when elements radiate from the same center in a circular pattern. Because all the elements radiate from that center, they will draw viewers to it – turning it into a strong focal point. A radially balanced design is visually interesting, but can only be used in specific types of designs that are built around the center. Sometimes designs that use mosaic balance may not seem balanced at all, and can often appear chaotic because there is no central focal point or line of symmetry. 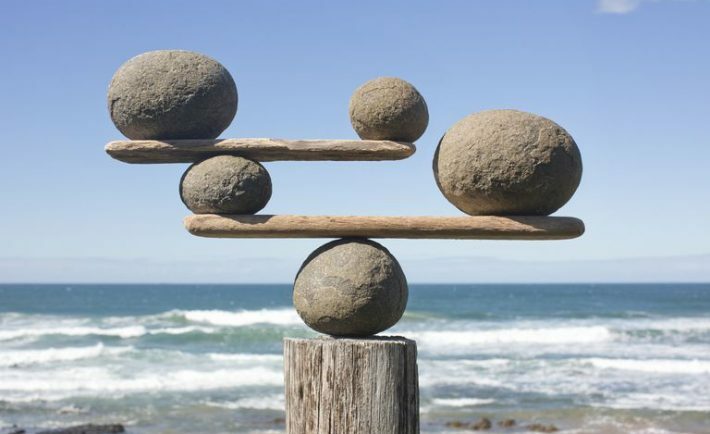 Instead this type of balance relies on repetition and consistency to create a very particular kind of balance. To use mosaic balance, you will need to evenly repeat elements that have equal visual weight throughout your design. That repetition will make the design balanced, provided it is applied consistently. As you can see each of these types of balance is distinct, and will require a certain amount of planning if you want to apply it to a design or photographic composition. However it is possible to alter the balance of designs or photos after the fact as well, and for example you could use Movavi Photo Editor to remove object from photo. In most cases you will want to balance the composition of your design using one of the types of balance described above. However there are some exceptions where you may want to intentionally create a design that isn’t balanced and make use of the visual tension that it results in. Regardless of which you choose – now that you know about the various types of balance, you should be able to balance your design composition more effectively.